The revolutionary 402 Flexion-Elevation Table has risen to the challenge of the most exacting doctor. It offers a more effective and comfortable way of adjusting, eliminating the pain and strain of your back as well as that of your patients. Fatigue is not a factor when using this new hydraulic flexion-distraction table. 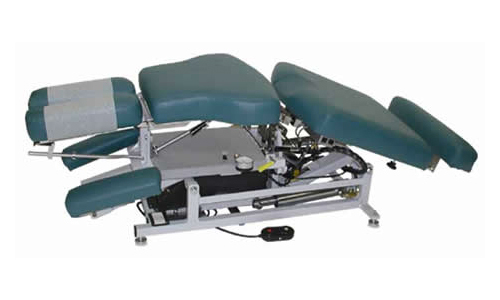 Hydraulic control provides more constant resistance through the flexion range, regardless of the patient’s size and weight. The 402 Flexion-Elevation features an incredible height range from 19.5″ to 39″ in 10 seconds and 24 degrees of flexion.ction. Lloyd’s drop design allows the amount of force applied to be equal, whether that force is applied on the right, left or center of the cushion, making them superior to other drops on the market. The automatic cocking drops are built into the table with controls on each side and can be set manually in the event of electric failure. No air compressor is required. A specially designed spring release on chest section is optional. Optional manual and automatic drops are available.